The two-story brick building at right is the original Monroe City Hall, which was built in 1908. 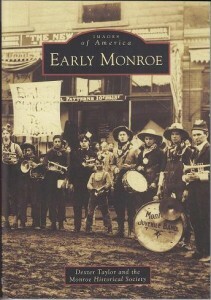 Today it houses the Monroe Historical Museum. 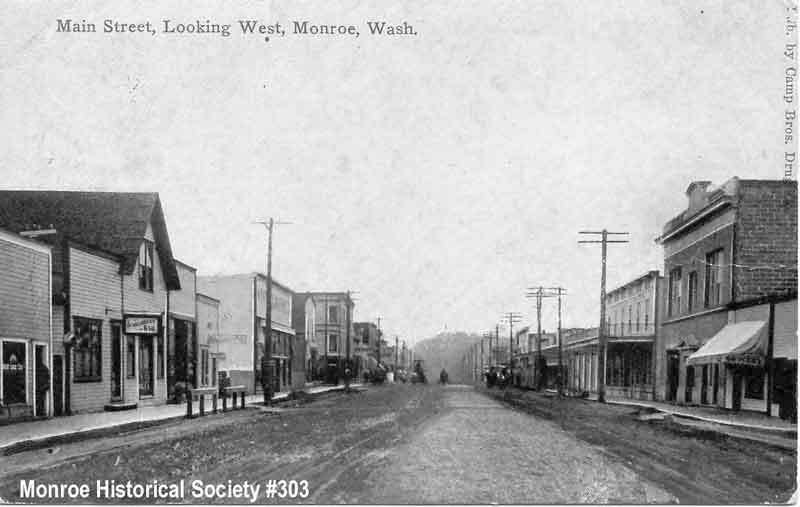 In March 1908, five years after Monroe’s incorporation, Mayor Ben L. Monck proposed building a city hall to be paid for by increasing the saloon license fee by $200 a year. Two months later in a marathon meeting, the council ordered the building of a two-story city hall at 207 East Main Street. It was designed by architects Kennedy and Baker of Everett and was to have a brick facade in an English design. On May 27, 1908, the bid for construction was awarded to J.J. Cretney, R.E. McKinnie, A.H. Lemon, and D.F. Stephens for $5,769.65 with work to commence immediately. The building was finished and paid for in November at a total cost of just over $7,000 after some changes were made in the building design. The above photo was taken shortly after completion. The new Monroe City Hall was fifty feet wide and sixty feet deep with a center stairway. On the ground floor, it had a 17×20 foot police court, a two-bunk jail cell, offices, and a 25×60-foot fire hall on the west side with a 56-foot bell tower with ropes and pulleys for suspending the fire hoses for drying. Upstairs, the council chamber across the back of the building was 28×50 feet with an 8×16-foot raised platform and a back row of glass windows. The library in the southeast corner was 21×24 feet with a 7×15-foot alcove at the back. It had a high panel settee containing lockers for dishes for receptions under the windows across the front. A 14-foot reading table was installed with a smaller six-foot table in the alcove for the librarian. The 21×24-foot room in the southwest corner was intended as a rest room accommodation for farmers’ wives while in town. Over time changes were made. In the 1950s, the fire hall expanded into a new concrete-block annex to the west and then moved out entirely to the new fire hall in the 1990s. The Monroe Library first exchanged places with the council chambers, then moved out entirely in 1967. Evergreen District Court took over the library space until its new courthouse was built near the Evergreen State Fairgrounds. City of Monroe offices, council chambers and the Police Department moved to the new Monroe City Hall on West Main Street in the early 1970s. 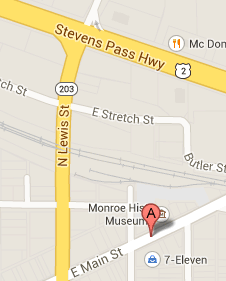 In 1982, the Monroe Historical Society opened its first museum in the two front rooms of the second floor. 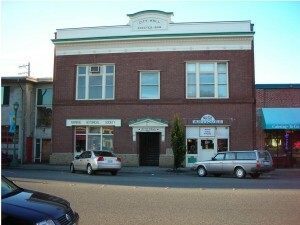 In the 1990s, the society purchased the old city hall building from the City of Monroe and now the museum occupies the old fire hall portion of the building on the ground floor.